When first published in 2009, Lucinda Scala Quinn's Mad Hungry met with critical acclaim, but it wasn't just the media that fell hard for this book--it was mothers everywhere, who embraced her message to bring back the family meal and loved the ease, simplicity, and robust goodness of her recipes. The book went on to launch a TV series (Mad Hungry with Lucinda Scala Quinn) and now, with over 65,000 copies sold, it is available in a paperback edition that will reach a yet wider audience. 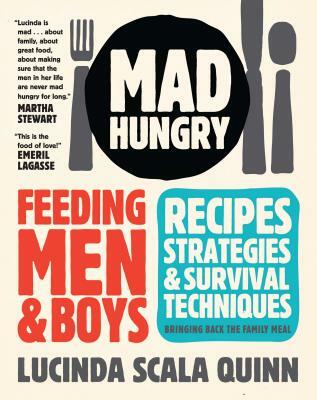 In Mad Hungry, Scala Quinn shares winning strategies for how to sate the seemingly insatiable, trade food for talk, and get men to manage in the kitchen. She provides recipes for single-skillet meals, dinners that yield fabulous leftovers, and dishes that are a cinch to stretch fore extra guests. Her grab-and-run breakfasts will help kids start the day right, and her healthful drinks make it easier for guys to say no to soda. Along with her techniques that help make homemade meals second nature, nourishing both diner and cook, Scala Quinn offers empowering advice on how to feed one's family's spirits as well as fill their bellies. Lucinda Scala Quinn is the founder of Mad Hungry, the headquarters for home cooks looking for proven recipes, strategies, and inspiration. She is the author of four cookbooks, including Mad Hungry: Feeding Men & Boys and Mad Hungry Cravings, and appears regularly on both morning television and QVC with her top-selling Mad Hungry kitchenware line. Lucinda Scala Quinn is the former senior vice president and executive editorial director of food and entertaining at Martha Stewart Living Omnimedia and the host of her own television show, Mad Hungry: Bringing Back the Family Meal, and she cohosted Everyday Food on PBS for six years. She lives and cooks with her husband and three sons in New York City.